Popularly known as akhrot, walnuts are a delicious way to add extra nutrition, flavor and crunch to a meal. It is a great source of omega-3 fatty acids. It is no surprise that the regal and delicious walnut comes from an ornamental tree that is highly prized for its beauty. Walnuts are loaded with immense health benefits. Being an extremely good source of folic acid, walnuts plays an important role in the brain development of the child, especially during the 1st 2 years of life. It also prevents the risk of neural tube defects-a fatal birth defect of the spine, spinal cord or brain. Due to high amount of antioxidants in walnuts, it proves to keep your immune system healthy and prevents onset of any disease. Walnuts are also known to improve your memory, concentration and delays signs of aging. Is walnuts safe for diabetics? The recommended carbohydrate intake per meal is 45 to 60 grams. To keep your blood sugar levels under control, do not overboard the amount of carbs recommended. 18 grams (approx. 7 whole pieces) of walnuts provides around 2g of carbs and so the glycemic load is just 1. Walnuts are one of the richest vegetarian source of omega-3 fatty acids (alpha linolenic acid) which helps in reducing inflammation responsible for cardiovascular diseases. It also helps in reducing LDL cholesterol levels. The protein content in walnuts contributes in increasing the satiety levels. Have your walnuts to munch on in between meals and feel full for a longer period of time. With extremely high amount of potassium, walnuts helps in muscle contraction and regulated blood pressure. 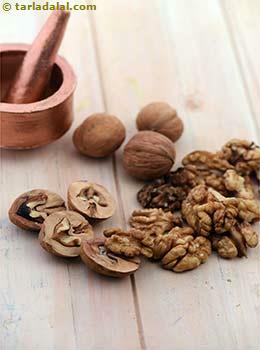 Magnesium and calcium in walnuts helps to increase the insulin response effectively, thus reduces insulin resistance. Is walnuts suitable for weight loss? Walnuts are nutritionally dense food providing around 124 calories for 7 whole pieces of walnuts (18 grams). Healthy nuts such as walnuts are known to maintain your ideal weight. Omega-3 fatty acids in walnuts reduces your inflammation which is one of the major cause of obesity. Try and replace your unhealthy snack with a small handful of walnuts. This will not only provide you adequate calories, but healthy fats (MUFA), protein and other beneficial nutrients as well. Consume walnuts in moderate amounts to get better results.